In the summer of 1965, when I was 15 years old, 2 friends and I saw what may have been a Bigfoot. We were spotlighting for whitetail deer near Deer Run, a few miles from Franklin, WV. Back then it was legal to spotlight deer, as long as you did not have a gun in the vehicle. I was riding in the front passenger seat, holding a powerful spotlight, when the light fell on what we thought at first was a very large black bear, standing on its hind legs. The creature was about 30 yards away in a field, about 10 feet below the road we were on. At first, it just stood there and looked at us, or rather I should say looked at the spotlight. I focused the light on its face and we immediately knew it was not a bear. It had an almost human-like face. It stood about 7 feet tall and was covered with long dark hair. After about 10 seconds, it turned away from us and walked across the field towards the woods. Just before the woods was a split rail fence. The creature climbed the fence, just like a human would. Once it got over the fence, it turned and looked back at us for about 5 seconds and then again turned away and disappeared into the woods. A few days later, we were again spotlighting and we saw it or another one that looked like it. The creature was standing between an old church and a graveyard. We only saw it for about 5 seconds, because it walked away very quickly. 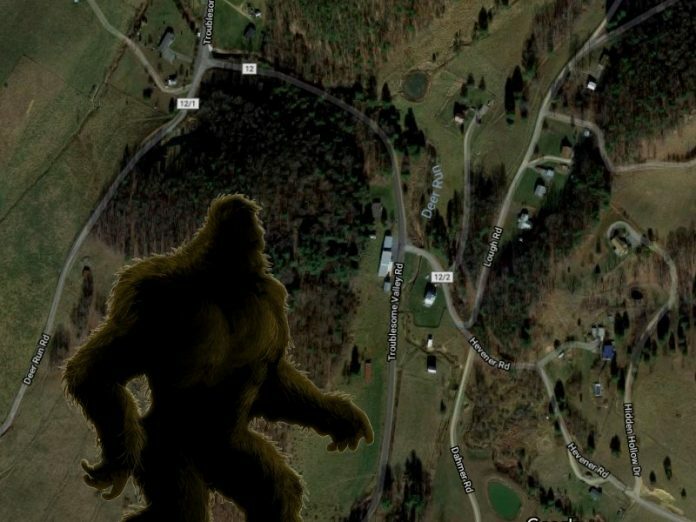 At the time of these sightings, we had never heard of Bigfoot and had no idea what it was. Looking back on the events, years later, I am convinced that it must have been a Bigfoot!